Bloodstained prayer shawl decoration found in Lodz Ghetto belonged to Jew murdered after Yom Kippur prayers in 1940. 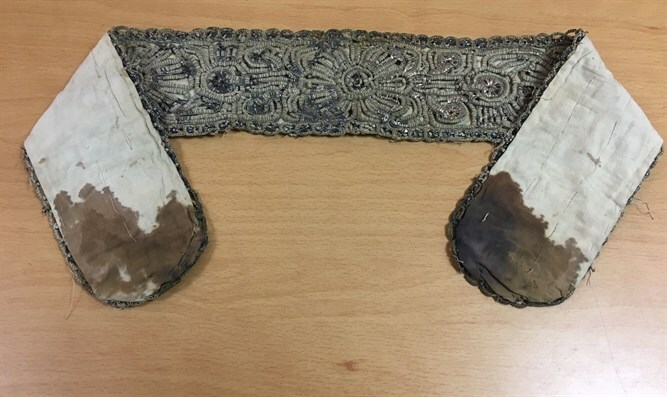 An bloodstained "atara" from a talit (prayer shawl) used during the Yom Kippur (Day of Atonement) prayers in the Lodz Ghetto in 1940 was found by a Shem Olam representative. The atara is a decorative piece often found at the top center of prayer shawls. It rests above the worshiper's forehead. The Holocaust-era atara was discovered in one of the ghetto buildings. "During a complex operation, and after many efforts, the talit's atara arrived in Israel, and it will be preserved in the Shem Olam Institute," the organization said in a statement. Shem Olam Director Rabbi Avraham Krieger said, "This is a chilling and rare discovery, which tells us about Jewish life in the ghetto, and about the unimaginable cruelty of the German murderers, who had no mercy even on the Jews' holiest day of the year, when they slaughtered, tortured, and murdered in cold blood." Those Jews who spent Yom Kippur of 1940 in the Lodz Ghetto felt lucky - the Germans allowed them to gather and pray publicly in a former theater hall which had been turned into a synagogue. The hall had closed after being included within the ghetto's boundaries. During the prayers, Judenrat head Chaim Rumkowski and German commanders sat at the front of the synagogue, on either side of the Holy Ark. When the prayers ended, many Jews, who had not succeeded in entering the makeshift synagogue gathered around. Ghetto authorities tried to disperse the crowd, cruelly beating many of the worshipers - both within and outside the synagogue. Within a few minutes, the scene became reminiscent of a pogrom. Some of the worshipers were beaten to death, and others until they were bleeding severely. Recently, the hall was renovated. 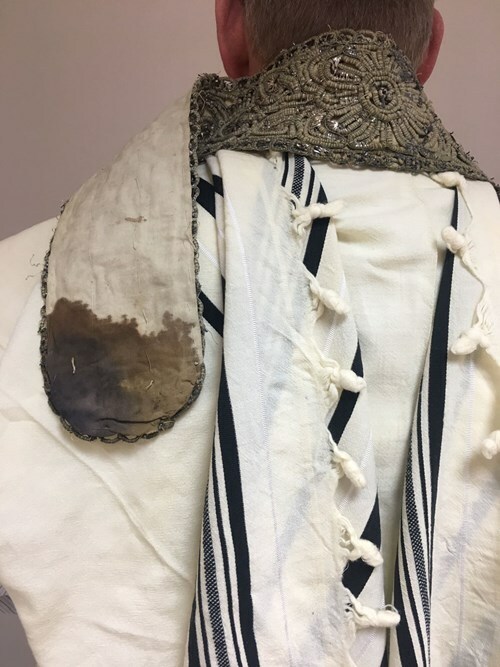 Beneath the wooden floor, several torn prayer books, decaying prayer shawls, Judaica, and a single, whole, atara - stained with the blood of a Jew murdered 78 years ago - were discovered. In a complex operation, the items were brought by a Shem Olam representative from Poland to Israel, where they will be carefully preserved and allowed to tell their story.